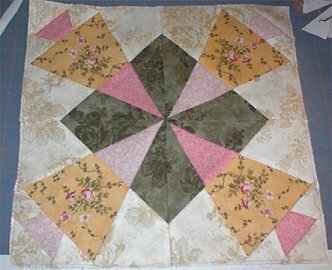 This makes a 12" block and is paper pieced! The first thing that I would recommend that you do, is go to the Practice Paper Piecing Page. 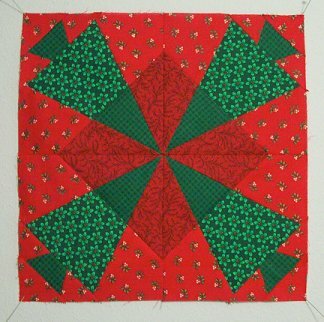 When you feel comfy with paper piecing, come on back and try The Pines Block! You will need to print out four copies of the template page per block you want to make on very lightweight paper. After your units are paper pieced, join each of the four corner quadrants as shown at far left...then piece the block. Press your seams open with putting the four sections together to help the center lay flatter. 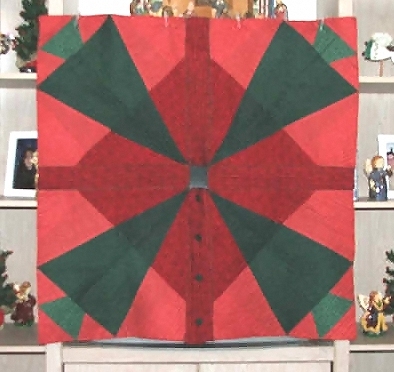 The quilt is four blocks by four, with a narrow border, then a border of extra tree units plus corner triangles, then a last narrow border. Hope you Like it! here's one that Mary made!